Now that I have Sundays off me and the SO are able to try out some of the events that only happen on weekends. 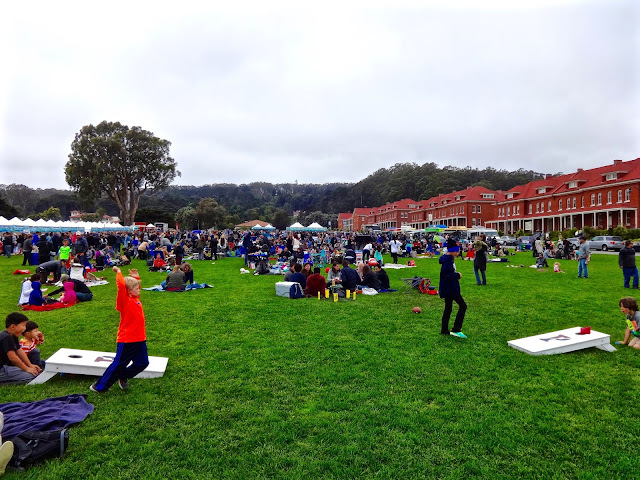 One of those is Off The Grid Picnic in the Presidio--part of the ever burgeoning collection of food truck pods/events that Off The Grid has propulgated over the years. This one is relatively new in their pantheon, yet, as you can see in the picture below, it has become quite popular. The closer you get to the ocean in San Francisco, the more likely you are to encounter clouds, fog and wind. The Presidio is neither immune, nor different to this caveat. And hey, what better way to spend a few Sunday afternoon hours than being surrounded by running, screaming kids and pets while sitting on the damp ground trying to stay warm and eat. It's like a dream come true for me. To be honest I didn't exactly what to expect at this event. We'd been to the Fort Mason version of this event several times. It's on Friday nights and again, a place that can be windy and chilly. That even has grown exponentially over the years and has lots of trucks and food stalls to choose from. By the time we got there the place was packed, mostly up toward the top of the hill and while there aren't as many actual food trucks, roughly seven here, there are a fair number of food stalls offering up other choices. (For my reviews of what we got you can scroll down this blog to the previous 2 entries or just click here and here.) They had a DJ here and he was pumping out what I'll call old-skool r&b jams--from like the 80's early 90's--hello Shalamar! So I was on board with that. Plus, I think getting there a few hours after it started was enough time for the lines at the vendors to go down and we had no trouble just walking up to windows and getting served quickly. I think if you are planning to spread a blanket on the ground and truly picnic, you'd need to come early to get a good spot. But seeing as how neither I nor the SO had any intention of sitting on wet grass we were fortunate enough to snag one of the table and chairs that are on some of the porches of the buildings surrounding the parade grounds. Actually, most of the tables were open, I suppose you come here to sit on the ground, and if you are up for it go right ahead. Otherwise, now you know, there is another option that was readily available if wet pants aren't your thing. Good for us also, sitting off to the side allowed us to watch the action on the field without having to worry about being trampled or sniffed by either pets of kids. Beyond the fact the day was gray and windy, I will say it was a fun time to just go somewhere and hang out for a bit, or at least until our fingers started to turn blue. (Reminder--take gloves next time) All in all, it was a fun excursion and is definitely worth the trip for either families or for something different to do in town on a Sunday, at least for an hour or so. But be sure to layer up it can get chilly. Though if you are a true San Franciscan, you probably already are. This little take out window in Hayes Valley seems to be all the rage now. Win a James Beard Award then quit your long time restaurant gig! Another restaurant departure and something called Taco Lab? Yes, there is such a thing as Meat Camp and it will set you back some serious dough. Outside Lands announces their food line-up, which seems to be just as popular as the music one. Here's a round-up of the chicken and waffle scene that continues to a bound in The Bay Area. It's a Mission dessert crawl! No wait! It's a breakfast sandwich crawl! It's that Bauer guys list of Top 100 restaurants in The Bay Area--according to his opinion. That Twitter building is getting another restaurant called Dirty Water--'cause that's an appealing name. Pastries! Pastries! Pastries! Bakers got some pastries! 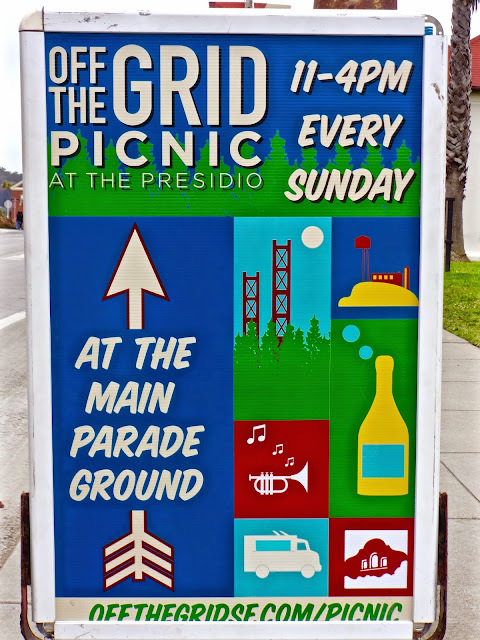 Finally, lest you think I'm kidding about kids, wind and sitting on the ground, here's another interpretation of Picnic in the Presidio--though looks like they hit it on the one sunny day.